Human depravity simulator/zombie survival game Day Z is every bit as intimidating as those who play it will tell you it is, but fortunately for the weak of heart there is now a free browser-based alternative, Mini DayZ. 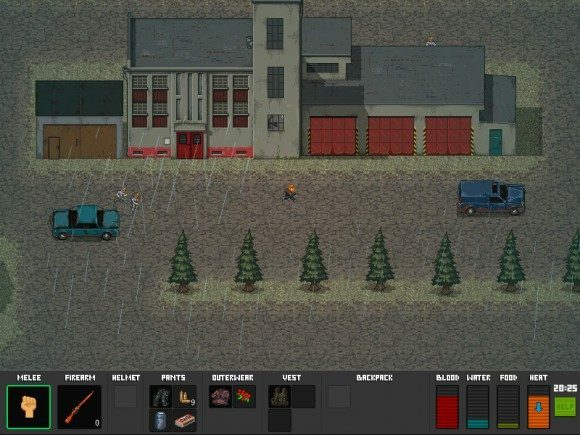 Mini DayZ adopts simplistic 2D graphics and a top-down perspective for a more accessible experience. You start out with nothing but the clothes on your back and hordes of zombies pursuing you, but exploration of houses will turn up supplies. The game requires you to keep track of your health, water levels, hunger and heat. Your health will automatically regenerate if your other three needs are kept at optimal levels, but as you’re likely to find out, this isn’t the easiest of tasks. Like the original Day Z, Mini DayZ is a fan project. This one is the work of CannedBits, a Russian gamer who caught the attention of Bohemia Interactive, who allowed him to post the game to their website. Bohemia’s Arma II is the game which Day Z is a mod of. I have to say, I absolutely love Mini DayZ. I think it’s awesome, amazing, addictive, and brings something really new to the experience. I’m so glad you’ve been able to make it even better! Ignore the haters, the vast majority of people think it’s fantastic and I am one of those people. Mini DayZ is free on Bohemia’s website, but you’ll need to create a username and password to play.